The Lions Club is a non-political, non-sectarian, non-secret organization established for the purpose of bringing together, at regular intervals, public-spirited and progressive men and women from the various business and recognized professions for their mutual advantage, and that their combined influence may be systematized and utilized for the welfare and up-building of their city and community and for the benefit of society at large. 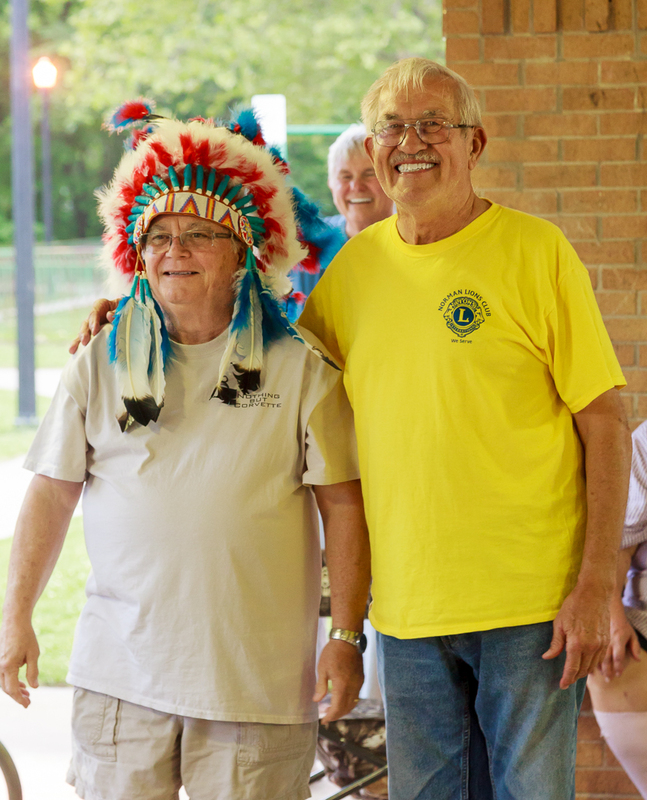 Outgoing President Duane Winegardner welcomes new President Alvin Cummings by passing on the ceremonial head-dress at the last meeting, the Lions Park picnic. Its objects are to unite its members in the closest bonds of friendship; good fellowship; and mutual understanding; to encourage active participation in all things that have to do with commercial and civic betterment; to uphold the principles in furthering the interest of its members and in bringing about a better understanding among men, women and the peoples of the world: to teach that organization, cooperation and reciprocity are better than rivalry, strife and destructive competition. Membership is acquired by invitation only. It endures for life unless forfeited by misconduct or by manifesting a spirt of non-interest in the club's activities, or for other good and sufficient cause.